Indolent ulcers, or recurrent ulcers, are a specific type corneal ulcer in which the outer layer of the cornea (the epithelium) will not adhere to the underlying layer (the stroma). This condition often times occurs spontaneously in dogs over 6 years of age. Certain breeds of dogs (Boxers) are more commonly affected. Regardless of the cause, these ulcers can persist for months if left untreated, causing pain and scar formation. The best therapy for these types of ulcers typically involves removal of the unhealthy surrounding tissue (debridement) followed by stimulation for healing using a small needle on the cornea (called a grid keratotomy). This minor procedure is done under topical anesthetic, usually at the time of the initial examination. Healing from the procedure normally takes approximately 2 weeks. The success rate for this form of therapy is about 90%. This does mean that 10% of dogs require more than one grid keratotomy be performed for resolution of the ulcer. Other therapies for ulcers include a superficial keratectomy, which removes all of the underlying and surrounding diseased tissue in a surgical manner using a microscope for visualization and under general anesthesia. This technique is generally reserved for severe, long-standing cases or the few patients that will not respond to multiple grid keratotomies. After the grid keratotomy is performed, the ophthalmologist may recommend placement of a contact lens for protection of the ulcer site and for pain control. The contact lens contains microscopic holes to allow medications to penetrate through it and reach the ulcer site. The contact lens does not need to be removed and cleaned, and in most situations stays in for a full 2 weeks, or at least long enough to encourage the healing process. If a contact lens was placed on your pet and it falls off, we just ask you to place it in water to prevent it from drying (tap water is fine) and call our office so we can ask you a few questions to determine whether replacement of the lens on the eye is necessary. Your pet’s own body will heal the ulcer, medications do not directly heal ulcers. Medications recommended by the ophthalmologists are utilized to try to prevent the ulcer site from getting infected, and to encourage healing. In some patients, age, concurrent disease or ulcer site infections can prolong the resolution of the ulcer. Your MedVet ophthalmologist will help assess your pet’s readiness for the procedure and the best way to ensure a smooth return to normal after the recommended procedure. This is not a type of ulcer that can be prevented. 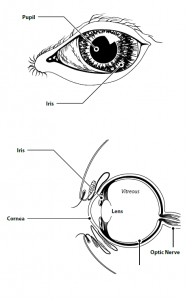 It is a defect in the layers of the cornea due to your dog’s age and/or breed. There is no way to determine how many gird keratotomies your pet will need for ulcer resolution. Once the initial ulcer is healed, your pet may develop this type of ulcer again in the same eye or the opposite eye. Do not allow your pet to rub at the eye. This will discourage healing, as your pet will be wiping away any cells that have started the healing process. If a contact lens is placed, rubbing the eye may result in it being removed. An Elizabethan collar (e-collar) is often recommended by the ophthalmologist to prevent the eye being disturbed after the procedure.